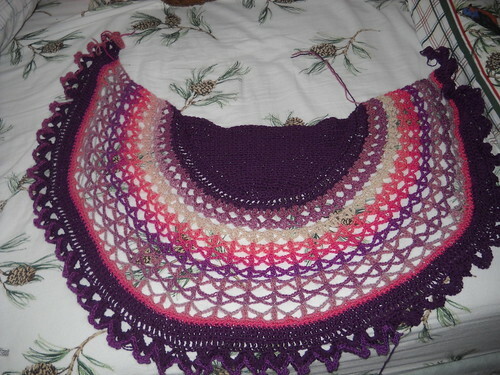 Still needs blocking, but finished otherwise! On Wednesday, I shared my Juliana that was halfway done. As I worked on it after school and during our evening television shows, I came to a realization. I figured out what colors I love working with: sunset colors-- rich purples, pinks with some yellows, blues and oranges. The Chroma I am using, Gossip, has some beautiful shades of pink and purple-- the only thing I don't like about the colorway is the muted pale pinks and purples that are used as the transitions. My Shallow Waters that I shared last week is still in a pile. I really appreciated the feedback on my color choices, but I think I'm going to take an alternative route and dye some yarn to match. I have Bare Stroll in the stash, and as long as I pick a light enough color, I can use that until the shawl is my desired size, and then re-dye to use with the last of my Pearlescent. 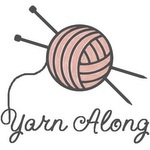 Due to my upcoming move, I'm really trying to commit to "Cold Sheeping" and am having some success being part of the Cold Sheep and Friends group on Ravelry. Two different discussions went on this week, one regarding the optimum number of WIPs, and the other discussing methods for finishing items that languish. 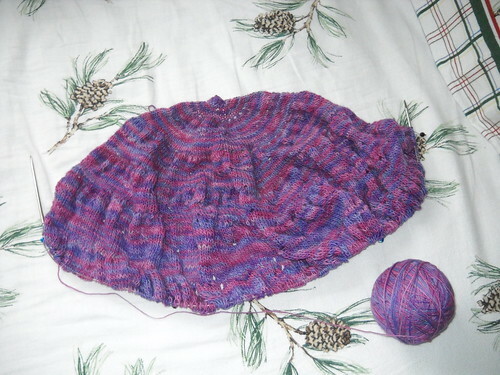 I particularly took to the second one, as I have a knitted Citron that had been a WIP since this time last year. The idea is to take 10 minutes each day to work on a long term project that you may not like as much. And to work on it BEFORE working on something that you like. So I've pulled it out. It is taking me over 10 minutes to just complete one row. 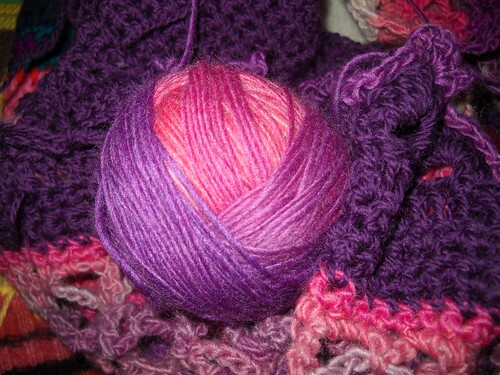 Originally, I wanted to use the entire skien of yarn that I had, but I'm thinking I probably wont anymore. So the only thing left is to decide when to stop. I couldn't capture the colors properly, and its hard to see the true size when my circs are too short. 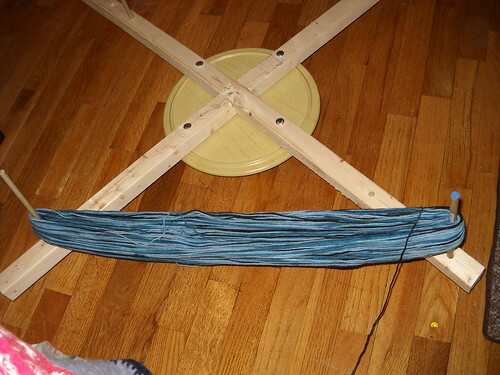 I've also taken a couple of skeins and wound them into balls on the new yarn swift my dad helped me make. It's not perfect, and it takes up lots of space, but I'm really pleased with how it turned out. 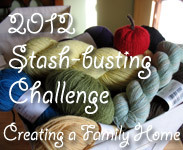 You should be seeing the newly balled yarns in my WIPs next week! I start teaching next week, 2 sections of 11th grade government. I'm nervous and excited, but it will cut into my crafting time ridiculously. The way my university sets up the student teaching expierence requires 2 weeks of "proper" lesson planning for each class being taught by the student teacher. My host teacher has 3 different classes, so I will end up with 6 weeks of full lesson plans for 3 different subjects. After the initial two weeks, the lesson plan format can be reduced, so the load will be worse for the month of February, and then ease up in March. Today marks the end of the 3rd of 14 weeks of my student teaching. So far, so good. Linking up with FO Friday! Oh your Juliana looks lovely! Love the colours and the pattern together. Your Juliana is gorgeous. I love the colors. They are perfect. Ah, I love those long-striping yarns! Your shawl looks great. GORGEOUS GORGEOUS GORGEOUS! I can't really say more than that. Oh wow! That. Is. Gorgeous!!!! The Juliana is lovely! Great colors.